Can Mary Landrieu be defeated in 2014 ? Historically, incumbent Democratic Senators in Louisiana have rarely worried about their re-election. In fact, in the past 30 years, an incumbent Democrat has only fallen below the 60% mark twice: (1) In 1980, the late Russell Long was re-elected by a 58-39% margin against Woody Jenkins (who was a Democrat back then), and (2) in 1990, former Senator J. Bennett Johnston was re-elected by a 54-44% margin against David Duke. (3) Her slippage in the white vote between 2002 and 2008 was mitigated by two extraordinary events: (1) Barack Obama’s victorious 2008 candidacy increased the black voting strength in Louisiana from 27 to 30% of the vote in four years (in fact, the white vote decreased 23,000 while the black vote increased 34,000 between the 2004 and 2008 Presidential elections); (2) Senator Landrieu’s visibility in the aftermath of Hurricane Katrina in 2005 clearly helped her throughout Metro New Orleans in her 2008 re-election race. 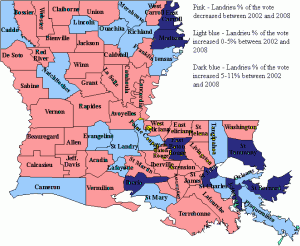 (3) In the remaining 20 parishes, Senator Landrieu saw her share of the vote increase from 49.8-50.2% to 53-45%. This was due to a heavier black turnout; thanks to Barack Obama’s candidacy, the black percentage of the vote in those parishes increased from 30 to 35% of the electorate. Clearly, Barack Obama’s candidacy helped, because had Senator Landrieu received her 2002 percentages in those parishes (and had she not received a bump from Hurricane Katrina), her 52-46% re-election victory in 2008 would have instead been 49-49% – a 14,000 vote victory margin, in other words. While we believe that Hurricane Katrina and Barack Obama were unique circumstances which benefitted Senator Landrieu in her 2008 re-election, we believe there are additional favorable circumstances in 2008 which would likely not happen again in 2014: (1) 2014 is not a Presidential election year, so she will not get historically high level s of Democratic turnout in 2014 like she did in 2008, (2) In her 2002 and 2008 re-election campaigns, she didn’t have any demonstrably liberal votes on legislation that could be used against her. It is true that back then, she voted against the confirmation for John Ashcroft for Attorney General and the Supreme Court confirmation of Samuel Alito. She also supported filibustering several of President Bush’s court nominees, but those votes taken together are not always viable campaign issues. In 2014, however, she will have liberal votes on health care and the stimulus plan on her record; (3) It also won’t help that she did not conduct town hall meetings, and there were accusations as well that her staff didn’t answer the phones. THOSE types of issues (as well as her recent votes) CAN be used against her n a 30 second campaign ad. In conclusion, even assuming she can hold on to her percentage of the white vote, given what we’ve described above, we believe that she starts off her re-election with a 49-49% race. Meaning she has very little margin for error, especially if she has a credible opponent.